Wishbone Day: Do you cast shadows or open doors? If you think awareness isn't enough ... just ask any person living with OI (or any other person labelled with disability) what awareness means to them. In the video below, Aimee Mullins talks about the power of words and how words shape our thinking and influence how we relate to each other. As you watch the video, please consider what reality you want to inspire. Do you cast shadows or open doors? Wishbone Day is an opportunity for us to challenge assumptions, alter realities and create new possibilities. 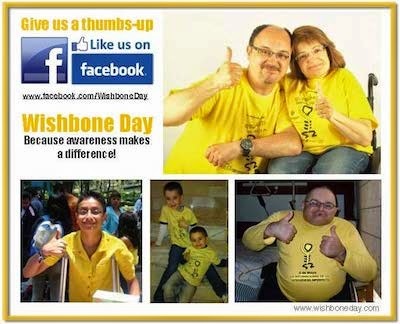 How will you use Wishbone Day to open doors? Please email us and let us know what you have planned.